AZ Medien is a diversified media and publishing company with a long tradition - it was founded in 1887 - and based in Aarau, Switzerland. Today the company controls a dozen regional newspapers, publishes eleven special interest magazines, and operates four TV stations. «wir eltern» is Switzerland’s biggest German-language magazine for moms and dads. It provides advice on fertility, pregnancy, birth and raising children in both print and online formats. Packed with well-researched and visually compelling features and reports, the magazine attracts a combined audience of 270,000 monthly readers. The «wir eltern» editorial team has excelled at producing a high-quality print publication. Yet the legacy CMS used by the magazine suffered from numerous limitations, forcing the team to adopt only a very basic design and, thus, miss out on a chance to build a distinct online presence. 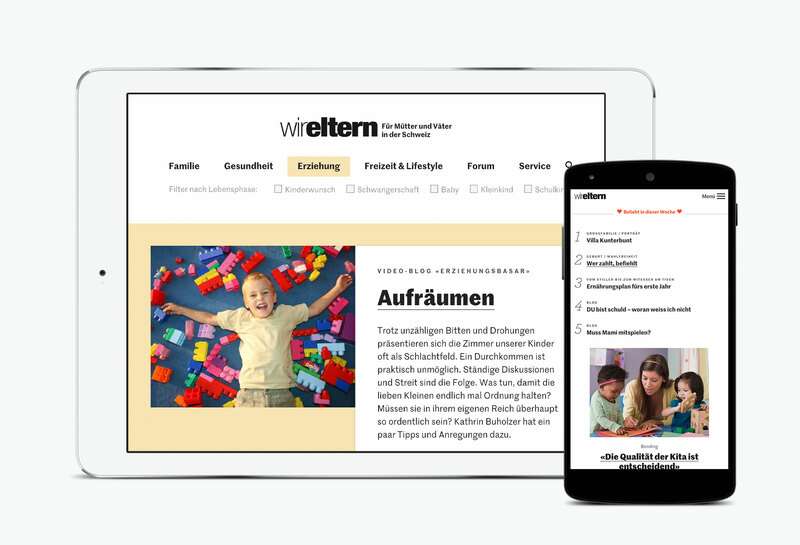 By enlisting Contentful and Edenspiekermann, a Contentful agency partner, «wir eltern» sought to re-establish its lead in the crowded market of Swiss online parenting magazines. Content published on «wir eltern»'s website comes from the print edition of the magazine. At the time when the current edition goes to printers, the online team receives a PDF version of the magazine and sets about transferring content into the CMS. This process was long-winded and tricky, forcing editors to rely on multiple work-arounds and compromising the final look of the magazine. Composing in the WYSIWYG editor, for example, threatened to break website styles and introduced extraneous code each time an editor pasted an entry from a PDF or Word document. The content model consisting of a single, rigidly-structured article type led to bloated entry forms and made it hard to deploy custom layouts for different magazine sections. The cluttered user interface, obscured important information and bred frustration among editors. “Replacing our legacy CMS with Contentful, without a doubt, made us more productive,” says Florian Helfrich, the Online Team Lead. The use of a markdown editor, for example, led to quicker text entry. “But what really excites me is that we are finally in a position to delight our audiences with an enticing, rich, and visually-compelling reading experience” notes Mr. Helfrich as he explains the impact of working with a CMS that now supports multiple article types with a unique structure and presentation layout. 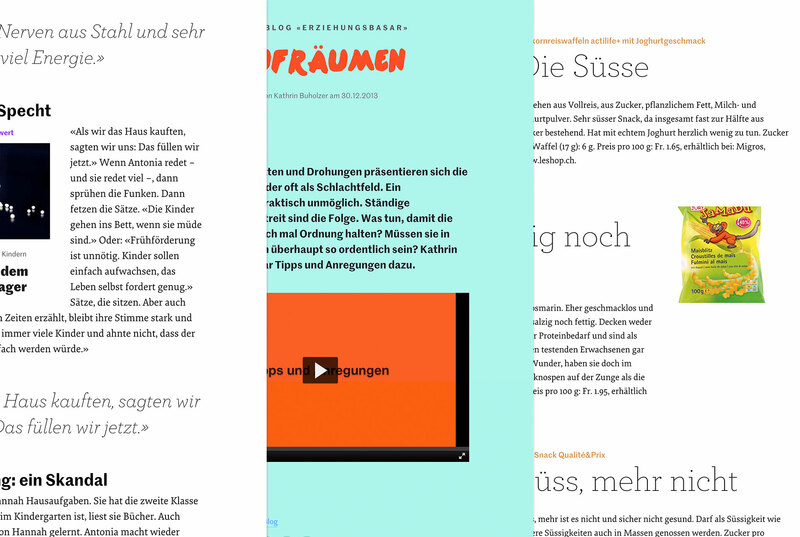 Flexible CMS allowed the wireltern.ch online portal to adopt custom layouts for different types of stories. Long-time readers of «wir eltern» magazine came to cherish the publication not only for its parenting advice, but also for its quality images and light-hearted illustrations. Alas, preparing, uploading, and publishing visual assets consumed an inordinate amount of time. For every article illustration, editors needed to crop the image to fit the dimensions of the teaser, homepage and in-article layout slots as well as scale them for desktop and mobile versions of the website. “Working with images used to be such a frustrating, time-consuming affair” tells Luigi Di Feo, the web publisher on the team, with a wince of pain. The team would use desktop tools to manually crop and resize images and then upload them to the CMS. Often times, the process would fail, because the legacy CMS restricted upload sizes or editors would inadvertently overwrite files by using identical names. “In the end, it could take up to 15 minutes to prepare and publish one simple photo,” estimates Mr. Di Feo. Contentful dealt with these image woes by completely eliminating the need to manually edit images. Thanks to its native image-processing capabilities, the CMS serves pictures scaled down to device-appropriate resolutions by default. Developers can additionally modify images by including parameters in the delivery URL. “When it comes to working with assets, Contentful brings very advanced features to the table, which helped us dramatically simplify our workflows,” concludes Mr. Di Feo. Realizing the value of an engaged audience, the «wir eltern» online team experiments with the use of surveys, competitions and guides on its website. Contentful helps it to innovate in yet another way - by embedding external videos. The integration with Kaltura, the video management platform used by AZ Medien, allows editors to search, preview, and attach videos directly in the entry editor. “The integration with Kaltura works so smoothly, at times our editors forget that the videos are actually hosted outside of Contentful” tells Mr. Helfrich. Advanced caching and image processing capabilities make wireltern.ch mobile version fast and responsive out of the box. The strategic benefits conferred by Contentful, however, do not end with improved organizational cooperation. According to Mr. Gugger, “The big headache all media businesses have is, how to keep up with new formats and platforms our readers embrace”. By storing and serving content in a platform-agnostic way, via a REST API, Contentful becomes an indispensable publishing tool in such environment. “Contentful solves the challenge of multi-platform publishing in a very efficient way, making it one of the better investments of our technology department”, adds Mr Gugger. As the most popular parenting magazine in Switzerland, «wir eltern» is exceptionally good at producing quality content, creating enticing design, and selling advertising space. Contentful complemented these skills by removing technical constraints, automating tedious tasks and centralizing the content creation process in a single, cloud-based application.